Before I rode my Enfield to Ladakh, I was petrified listening to horrific tales of water crossings in the mountains. When the time came to do the first water crossings I froze in fear. Somehow I mustered up the courage and rode my motorcycle across the icy cold stream making its way down the mountain and across the road. It didn’t seem that bad at all. The rest of the water crossings were done with the same ease as the first. Months later I joined a group of crazies who go by the name of Goa Trail Riders. We often come across streams while riding through the jungles of the western ghats. In some cases these streams have proper bridges across them. But we try and cross the stream by riding our bikes through them. The bridge is always Plan B. What’s the fun in riding over a bridge when there is a stream to conquer? 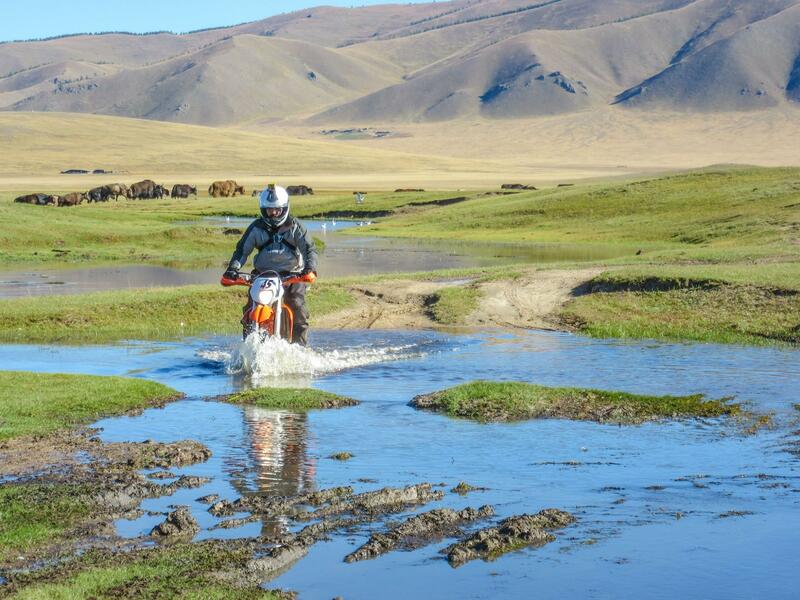 While riding in Mongolia I lost count of the number of streams we crossed while riding across the steppes. There were other riders in the group who had a lot of experience riding in the dirt, but little to no experience riding through streams. They were apprehensive at first, but by the end of the ride, all their fears were gone and everyone was merrily crossing streams. The key in riding a motorcycle through a stream is to stand on the foot pegs and force down on the handlebar to keep it straight. I don’t know if that is the correct textbook technique, but it has been working well for me so far. It’s important that you stand on the pegs because that way it’s much easier to shift your body weight around to balance yourself and keep your motorcycle upright. While sitting your body movement is restricted. Also if you fall you can jump off the bike far more easily if you are standing on the pegs as opposed to sitting down. The only time it makes sense to sit and ride across a stream is when you are intentionally waddling through. For example, if the stream bed is made up of large and slippery rocks, it’s a huge gamble to try and ride straight through it. You either need a tremendous amount of skill or a tremendous amount of luck, or maybe both. It’s always a good idea to wade through the stream to check the depth and nature of the stream bed before riding your motorcycle through it. A raised exhaust helps, but isn’t absolutely necessary. As long as you are able to keep the engine running at a decent RPM, the outgoing exhaust gases will prevent the water from entering in. However, pay special attention to the height of the air filter. If it goes under water your engine will suffocate and die, leading to water entering your engine from both sides, intake as well as exhaust. When riding a motorcycle you normally look up ahead so that you can plan for the next thing. But when riding through a stream, it makes sense to look right down in front of you. If you look up ahead, you won’t be able to see anything anyway. But by looking down you may be able to spot a rock or something through the water if its clear enough. Common sense dictates that its a good idea to follow the track the rider ahead of you just took. However, bear in mind that if the stream bed is soft mud, the track will become deeper with each passing motorcycle. You may have a situation where the first rider made it across the stream while the last rider ended up flooding his engine. To me water crossings and hill climbs are the best part of a trail ride. Technique helps. But all the technique in the world is useless if there is fear in the mind. Confidence kills fear. But confidence is built over time by doing the thing over and over again. So the big question is how do you over come fear when you are about to do something for the first time? Well, the answer is that you don’t. You do it the first time scared shitless. But you bloody well do it. If you succeed you start building confidence. If you fail, you do it again. There is no short cut to this.